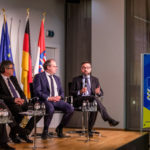 PRESS RELEASE: Trust in Digital Life (TDL) will host a strategic roundtable on ‘Building Trust in Artificial Intelligence (AI)’ on 20 March in Brussels, with the support of the Representation of the State of Hessen to the EU. TDL will use the opportunity to create a working group on AI and to plan for further AI events with partner organisations across Europe. The event will comprise representatives from academia, industry, and the European institutions involved in the wide-ranging questions around AI. The opportunities and challenges associated with all the topics under discussion are expected to provoke a lively debate, spark ideas and generate insights into how Europe can move forward into an AI future. Follow TDL on Twitter and LinkedIn for news and event updates.